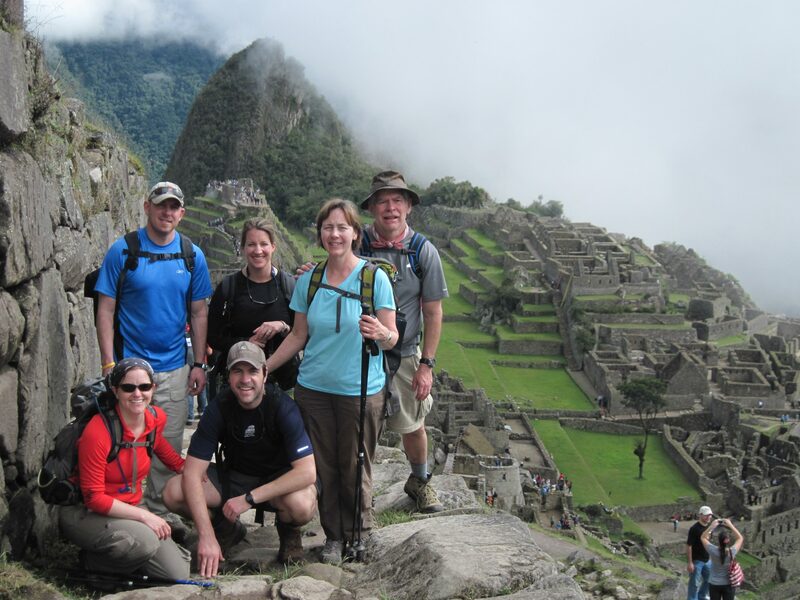 Kat trekked Peru’s famous Inca Trail and has opened her diary for us. We are picked up at 6am by our guide William. It’s just my husband and I trekking and we have 2 cooks and 2 porters with us. The cooks are from Cusco, equipped with food for 4 days and an incredible creativity to create the most delicious meal on humble cooking equipment. The porters traditionally come from rural communities in the Sacred Valley. They work exclusively for our partner agency and part of the money spent on our trek will go into a fund for them and their families . We drive about 1.5 hours to the town of Ollantaytambo where we have the chance to buy last bit and bobs and have breakfast, then 30 minutes to the trailhead. KM82 – our adventure officially starts. It is busy, with tourist groups arriving, guides explaining and staff packing their enormous rucksacks. Each porter/ cook will carry up to 20kg and each bag is carefully weighed to ensure this rule is obeyed. We show permits and passports and then we are off, crossing the bridge over the Urubamba River and gently climbing uphill along a pleasant path. On this part of the trek we meet lots of locals – 2,000 people live here in settlements along the way. Red plastic bags hoisted on wooden poles catch my eye. “Chicha”, says William – it’s a sign that chicha is ready and available to buy, the popular fermented maize drink of this region. William turns out to be an endless fountain of knowledge and explains medicinal uses of the plants we see, as well as naming the mountaintops surrounding us. We start at 2,550m and will climb to 3,200m today, a gentle introduction to our trek. We are rewarded with views of the impressive LLactapata ruins below us, where the Cusicacha River meets the Urubamba River. Lunch awaits soon after – and with it our first pleasant surprise of a complete 3 course meal, served in a dining tent. With full bellies we walk on, and after a wonderful first day arrive at our campsite for tonight, Jatun Chaka. Each group is assigned a campsite, which are spread along the way. All tents have already been put up and our kitchen team is awaiting us with a bowl of popcorn and a cup of tea. There is time to relax and I’m glad I’ve managed to bring a book as part of my allowed 6kg as it’s a good way to pass time at camp. It’s another three courses of ample servings for dinner, followed by brushing teeth under starry skies before falling asleep in our warm sleeping bags, on comfy thermarest mattresses. “Tecito de Coca” is our wake up call the next morning – a cup of Coca tea, brought to our tent together with a bowl of warm water to wash. Breakfast doesn’t disappoint, porridge and a delicious omelette give us energy to get going. We will need the energy today, as the “Dead Woman’s Pass” awaits – at ,4200m the biggest challenge of our trek. “Take it easy, one foot in front of the other, gentle walking – and enjoy the scenery”, William says. So we plod on, first through beautiful, fairy-tale like mossy woods, then out in the open surrounded by views of the mountains beside us and the valley behind us. After 2 hours we reach the pass and pose for a well-deserved picture. I quickly realise that I certainly won’t go hungry on this trek – every day we are given a little goodie bag of snacks to keep our energy levels high. Walking poles help knees on the descent that follows, down to our second campsite (Pacamayo) at 3,600m. The views from our tent are breath taking. Dead Woman´s pass, Inca Trail, Peru. Today we start off with an uphill to the Runkuray ruins, which we reach after about 30 minutes. Clouds are hanging low today – no views but instead a wonderfully mystical atmosphere. We’re Scottish, so walking in the hills with no view is nothing new to us. At the top of the pass we offer Mother Earth, or Pachamama, coca leaves before descending again. The clouds have lifted by now. After an hour we reach the ruins of Sayacmarca, overlooking the valley below. William shares his knowledge on the life and culture of the Incas with us, bringing the ruins to life for us. Gradually we descend into cloud forest and catch glimpses of the mighty Salkantay peak in the distance. We’re not done yet and before long find ourselves climbing to the third pass at Phuyupatamarca. Lunchtime! From here it’s all downhill. About 3,000 steps of downhill – two whole hours during which I thank my husband for bringing walking sticks. When the going gets tough we are rewarded with stunning views and the fact that before us the ancient Incas have walked this path. Below us runs the Urubamba river and ahead of us lie the terraces of Intipata and most importantly, Machu Picchu Mountain. We’re getting closer. After 30 more minutes we reach a fork in the path and have the choice of heading straight to camp, or venture on the longer path to see the site at Intipata. We reach for snacks and get the energy to go on the detour. It is worth it – we have the ruins to ourselves and the views are beautiful. We take our time and enjoy the peace and quiet. After this, the arrival at Winay Wayna campsite is a shock to the system – of all the campsites, this is the busiest as it’s the last before reaching Machu Picchu. It can be very crowded, don’t let this ruin the last day for you – the nearby Winay Wayna ruins are surprisingly quiet and really rather lovely. Uff, it’s an unpleasantly early start. Logistics of getting trekking staff back to Cusco early and to a (admittedly lesser) extent the desire to arrive at Machu Picchu for sunrise means we are leaving camp at 3:30am. It also means that after 1.5 hours, we arrive at the gates of Machu Picchu before they open and sit in darkness while we wait. It doesn’t make sense but it’s just one of these things that every hiker has to do. And once we are in the site, once we enjoy our first glimpse of the beauty that is Machu Picchu, we’ve forgotten our slight frustration. It’s magnificent. And even more so after 3 days of trekking. Accommodation - really good and spacious tents, though the toilets at the campsites were ropey at times! / food - excellent and attentive chefs. What they acheived of the move was amazing, delicious and diverse. Also catered well for vegetarians. Overall organisation - excellent - couldn't fault it, and was very adaptable to the situation and people's conditions.